The artist, Talia Lampert, is a New York artist who does “Bike Paintings.” Gorgeous, colorful paintings of … well… real bikes. Not high-end $20,000 bikes made of the latest mode of unobtainium, but real people’s bikes. You can see her work here. I purchased the right to use one of Talia’s paintings for one of my cards. I’ve been sitting on it for over a year… This week my artist-in-residence, my step-son’s wife, designer extraordinaire Teresa Johns, put the thing together in grand fashion. You can see the results below. 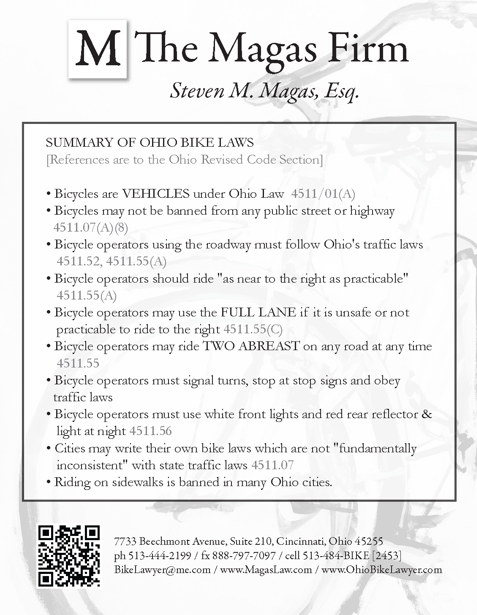 The back of the card will offer, in a much more lawyerly font, a summary of Ohio’s Bike Laws, with reference to the Ohio Revised Code sections. We need to do that down here. Nice job. Samuel – send me an email at bikelawyer@me.com and include your address… I ship a bunch over! Just new to biking to stay in shape. Thanks so much for summarizing the Ohio Revised Code. I plan to make a copy and keep it on the bike. Making “spoke cards” is an excellent idea. Good Question – Every case is fact specific. What is “AFRAP”? There’s no definition in the code… so one officer’s “far enough” is the next one’s “not far enough”- we’ve had a couple of those cases, both victories- Passing a bike improperly can lead to a ticket, or worse… or not – I spent two years in litigation on a case where the issue was whether the cyclist had signaled a turn before starting to turn and whether the truck was roared up from behind should have seen the signal – You can’t begin to cover all the goofy things that happen in real life – but knowing the basic rules, and being confident enough to talk to a cop about them, puts you WAY ahead of the curve! That’s why I created the card, to give cyclists some confidence when dealing with motorists or cops in situations which will be, undoubtedly, stressful for the rider! 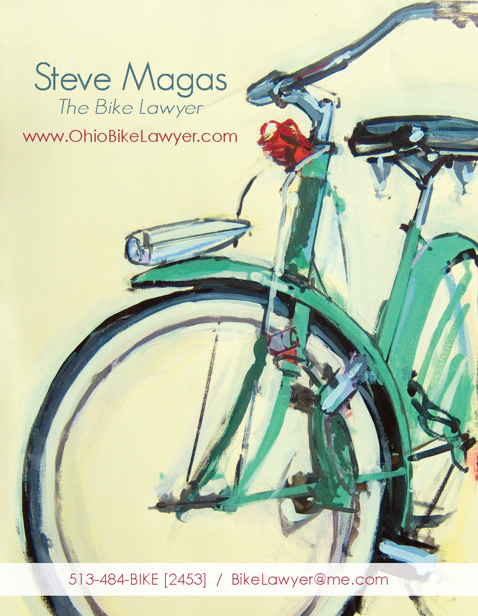 Read all of Ohio's Bike Laws [and my commentary] — Plus, you can Report a Crash and store ALL phone data relative to your crash in one place — photos, videos, GPS data, witness statements.